It's getting to be that time of year again. The time where the weather goes from perfect to so swelteringly hot & sticky that I have to wear my hair up 97% (actual statistic)of the time. I am on the hunt for a new batch of twisted and braided looks that get my hair off of my face while maintaining a polished look. i've tried many of the braids but they don't work for me! i have fine, thin hair. do you need to have thick hair for most of these styles? I think it's that time of year again only for people who live in South Texas. The temperature here today is 33. I am SO jealous of your weather! 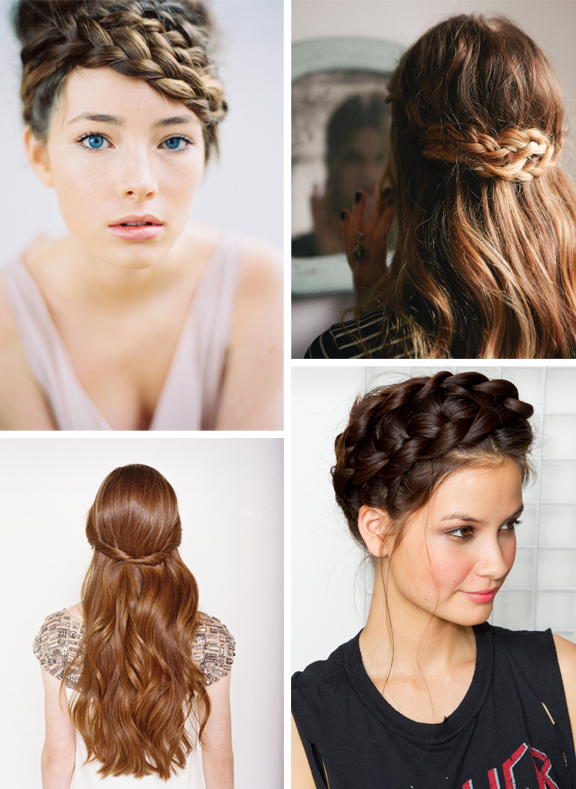 I love that bottom right picture, and I totally need to figure out how to do that with my own hair. Except maybe with not quite so many wispies. I'm not a fan of excessive wispies.